This finite analysis by Williams Wheels confirms almost everything I said years ago in this post on the superiority of custom built wheels, and ESPECIALLY, the folly of Mavic's Isopulse system, where the drive side is radially laced (pg 1 is blank, scroll down). This analysis was for 28 spoke wheels, not 32. I don't do disk brakes, living in a dry climate, and probably never will, but the analysis is valid for both. In this analysis the 3x/3x wheel provided the best combination of strength, stiffness, power transfer and reliability. The 3x/3x wheel outperformed the two half radial wheels because allof the spokes share the power. In the half radial wheels, only the crossed spokes transfer power – the radial spokes only support rider weight. The 2x/2x wheel matched the 3x/3x wheel in stiffness and power transfer, but the 3x/3x wheel won on fatigue strength. This is because the spokes emerge from the hub at an angle nearly tangent to the hub flange. This is true with a 28 spoke wheel; however, as the number of spokes in the wheel increases or decreases, the number of spoke crossings would need to be adjusted to maintain the tangent condition. Accordingly, 2x lacing should be used with 20 spokes or less, 3x lacing should be used with 24 or 28 spokes, and 4x lacing should be used with 32 spokes or greater. So it is concluded that the best rear wheel is cross laced on both sides with number of crossing chosen to make the spokes as close to tangent to the hub flange as possible. Interesting conclusion in that 2x is tangent to the hub flange at 24 spokes, and 3x at ~34 spokes. For 40 spokes, 4x is tangent, but 4x is past tangent for 32 & 36 spokes, as 3x spoking is for 28. For 32 spokes, 3x is just slightly under-tangent, and at 2x, 28 slightly more so. Keep in mind that every spoke creates more wind drag, no matter how thin or bladed, so spoke count itself is a trade-off. Tangent spokes pull on the wheel most directly, at a 90 degree angle, not off to one side or the other, just the way you'd stand to pull on a beam with a rope. They also pull against each other at the hub, pulling in EXACTLY opposite directions, so there is no net stress on the hub, unlike radial spoking where the spokes are always trying to rip the spokes out of their holes. The spoking pattern with the lowest range of tension is, all other things being equal, the best, as it puts the least stress on the spokes, hubs, rim with each turn. As you may have guessed, I'm looking at buying new wheels again, this time for something that cheats the strong winds here, and tubeless to rein in flats, as this high desert is chock full of thorns that get bad enough to flat me every-other ride at times. At $8 a tube, that's not only really inconvenient, but expensive too. After a lot of back & forth with Fairwheel Bikes, I'm leaning towards Colorado Cyclist again, (gulp - had some trouble with them before, but no good builder within 50mi of here) building on Chris King or DT Swiss hubs and Easton R90 SL rims, built 28/24 - 3x and 2x with bladed spokes. Fairwheel Bikes customer service has been a little out to lunch - not necessarily bad, but slow to respond and most recently, a mail server meltdown that lost my order. Fairwheel does have some very nice Ti Carbon hubs that are very light though, and a great reputation, so I wouldn't want you to rule them out without talking to them. To be fair, at least part of the delay with Fairwheel was affordability on my end. At 190lbs I don't quite trust the Ti Carbon hubs (162 grams rear hubs) to be durable enough long-term, nor Easton's factory built EA90 SL road wheelset with 24/20 spoking. I stumbled across the Williams Wheels analysis trying to check the right box on Colorado Cyclist build options pull-down, specifying 2x or 3x with 28 spokes. I would have gone with 2x, but this clearly says 3x is better. Unfortunately, it's a computer analysis with no follow-up reporting variance with real-world testing of a prototype, but still compelling. As an update, after crashing and completely mangling my front wheel, I bought an "emergency" Mavic Cosmic Elite expecting it to last a few years. That was 7 yrs ago, 2 of which I didn't ride, but still surprised they're still serviceable, though at ~ 850 grams they're heavy and now loose as a goose. I rebuilt a new wheel on the Ultegra 6700 hub, switching to DT Swiss 465 rims with DT Revolution spokes and those ride SO, SO, SO much better around here on badly broken road surfaces. In addition to the Revolution spokes, I think the 3x lacing is a big help in making them more compliant than the radial Cosmic Elite - enough so that I am going with 2x lacing on my new front wheel. With bladed spokes I think 3x in front would be a little dense for the fierce cross-winds we get around here, and with rim brakes, there's no torque to consider. Radial would work fine, but would be a harsher ride. I've been riding this new 6703 Ultegra crank for about a year now, so unable to ride while healing up from my crash (quite well, btw) I decided as part of repairing damage to the shifter face plates and handlebar tape, mirror etc. I would perform some long-overdue seasonal cleaning and adjustments. Having shrunk my handlebar stem from 120mm to 100mm to account for me shrinking with age (EEeeeek!) I needed to shorten and re-thread my shifter and brake cables and housing. Not such a big deal except I have aerobars, a headlight, and a Garmin to accommodate, and it makes for a very busy cockpit to put together. I also wanted to thoroughly clean the frame, and polish it, which is a lot easier, and really only possible on my bike with the crank pulled. I also pulled off the derailleurs so the frame was completely unencumbered, before threading new shifter cables; a seasonal maintenance thing for me as I'm very active on the gears when riding. This still left the assembly of the crank to be done, and after a few days of being torn down and set aside I had to figure out exactly how it went back together. I Googled for the official Shimano R&R instructions and found most of that targeted at the 2-ring 6700, which left some questions in my mind. Online videos were also not very helpful, but I did find one Blog that was helpful (linked at the bottom here), but even that left some question marks about how to tear down the chainring assembly, vs R&R of the whole crank assembly. This YouTube video is pretty good at showing the details of how to R&R the crankset, with a few caveats. 1st, hammers and bearings don't mix. Hammering on a bearing peens the balls into the races and ruins the bearings. Plastic and rubber mallets get metal bits embedded in them over time,so hammering any finished surface with them is a BAD idea. If you must risk peening your bearings or breaking them by using a hammer (a VERY crappy idea) put a clean cloth or bit of inner-tube over the surface you are fixing to bash. I've never yet had to do this and think it's a really horrible idea, but hey, it's your pocketbook. 2nd, the Shimano bottom brackets are all sealed bearing systems, so the lube you put on the spindle is purely for sealing out moisture - which is impossible - and water displacement. The volume of air inside your bike's tubes holds more air when that air is dense(cold) than when thin(hot), so everyday heating and cooling is going to force the frame to "breathe", and if that air has moisture in it, which it will, when it cools beyond the dew-point you will get water inside your frame tubes. Bike mfgs know this, that's why they put a small hole in the bottom of the bottom bracket shell. This doesn't mean grease can't protect your bits from rusting by DISPLACING water, but that's a different requirement than lubricating a bearing or bushing. 3rd, when loosening ANYTHING with a torque specification, just as when tightening it, use a torque sequence, or make one up to follow, and loosen the bolts bit by bit. When R&R-ing the chainrings for example, don't go around, hop back and forth to opposite sides and loosen a bit at a time. 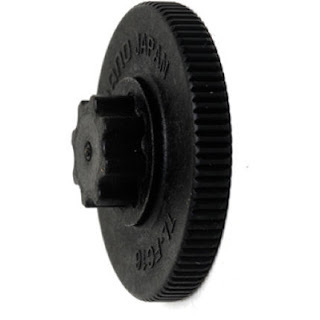 4th, go easy with the little plastic thing-a-magiggy that sets the bearing pre-load. With any sealed bearing the bearing is just slid into position on a tube. As long as that position is maintained it's going to work properly. 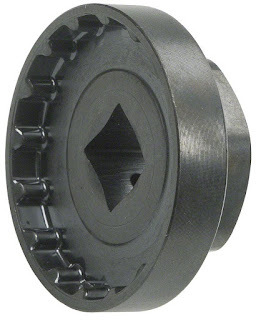 This in contrast to ball bearings where the cups and cones are ground at ~ 45 degree angle so the pre-load has a big impact on how the balls engage the encasing surfaces. After the 1st ride, recheck the preload and snug it up if it needs it. 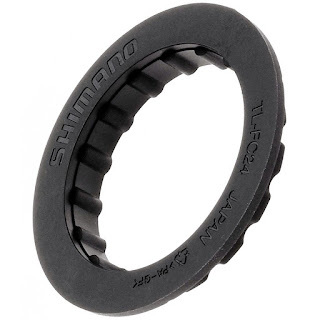 Finally, the polymer tool that comes with Shimano bottom brackets, shown below, will never mark up your BB, so I would RX that over the metal toothed steel wrench seen in the video. It works best with the "socket" style BB tool below that completely covers it. Put the bike on its side like you're branding a calf so you can push against the BB and you can get is as tight as you need it without slipping. I couldn't find a good video of how to tear down a Hollowtech triple crank, and can't find my tripod to make one myself (yet), but did take some helpful still photos. Note, the comments are on the bottom of the photos. These mostly deal with how to properly align the chainrings before bolting them together. The 6703 uses Torx-30, not 5mm hex head nuts, but otherwise the same. When working with a triple like the 6703, take it apart from the smallest to the largest ring, BUT, when reassembling it, put the inner TWO rings together as a sub-assembly and then bolt that to the spider and outer ring. The torque needed to break the bolts free can then be managed by holding onto the crank arm. Trust me. There a LOT of ways to get this wrong. Proper alignment of the outer ring is easy, the chain-drop pin must be centered over the crank arm. If it wasn't, it couldn't keep your chain from falling down into that nasty crack. Note there are two registration marks indicating alignment here. A "pip" on the small ring and a ^ mark on the middle ring. Make CERTAIN those are pointing right at the crank arm. Here you can see the back of the chain-drop pin, pip, and ^ all lined up, pointing at the crank arm. Shimano's official docs make a big deal out of where the stamping are on the chainrings. They're on the outside for the large chainring so Shimano can advertise, but are facing inwards on the middle and smallest chainring - FWIW. Use the registration marks for alignment. The stampings move around all the time, so OK for tooth info, but not for alignment. Lower right corner points out the chainring stampings as outside on the large ring and inside on the two smaller rings, just in case it isn't obvious. These are the ring and spacer parts referenced in the info box next to #6 in the Shimano doc below. The ring goes on 1st and engages a raised plastic ring on the face of the spacer. The smaller side of the spacer goes towards the BB and the larger diameter side towards the removable crank arm. There is a plastic last-ditch retention dohicky (stopper plate; no midnight oil burned naming that!) that engages the hole in the crank seen in the photo below. The slotted end goes to the outside and the hole goes to the inside. If you can't get this part to seat you have the two crank arms parallel instead of offset 180 degrees. I'm tempted to scoff at this "lawyer plate", meant to keep Shimano from getting sued, probably for the 2nd time, but actually it's pretty clever and might save you from injury if those pinch bolts both failed, or your brother-in-law isn't quite the mechanic he assured you he was. Plus, it gives you a better indication of how tight those pinch bolts are getting. If you aren't sure, use a torque wrench. BEFORE tightening the removable crankarm's pinch bolts, BEFORE, set the preload so there is no play in the crank, especially at the ends of the arms. Only when the pre-load is set should you begin locking the crankarm into place by torquing the pinch bolts down, little-by-little, going back and forth between them. Make very sure those pinch bolts and their engagement threads are absolutely clean, and lightly oiled, so you get a good feel or torque reading. When in doubt, torque it out! Trying to make a right-hand turn with traffic behind me, my back wheel slid out from under me at an intersection the street-sweeper did a PERFECT job of evenly distributing sand all over - the entire 50ft diameter of the intersection. Like greased glass. My 1st crash in 8 years. While I would normally just extend, crossing into the other lane and going off onto the opposite shoulder, as luck would have it a school just down the street, on what is usually a very quiet street, had just let out, so there was a line of traffic waiting at the stop sign across the street, making this impossible. I knew immediately upon falling that I had broken something in my hip, and asked they guy who was stopped in front of the stop sign in his SUV if he would take me home. He agreed, so I was able to get home quickly, whereupon Deb took me to the ER. As it happened, the stitches in her hand from a recent surgery had opened up and she was dripping blood all over the place when we got to the house. In the confusion I left my helmet (ruined, I'm sure), sunglasses (ouch), cockpit light and taillight in his car. No contact info was exchanged in the mayhem either, so no way to get in touch with him. When we got the results of the X-Ray @ the ER I felt very lucky, as I feared a broken femur, femur head, or pelvis. A fractured pelvis is really quite painful in a very thuddy way, vs a collarbone by contrast, which can be quite a sharp pain. There was no displacement of the bone in my case though, so, again, very lucky. Road rash was very limited, mostly on my outer thigh, but quite deep. It's still not fully healed. With road rash, more shallow is probably better than a little that is very deep. Deb stepped off a curb walking the dog 2 years ago almost to the day and sustained the same injury, so I had some idea what I was in for, but I seem to be healing up a lot faster, so perhaps my injury, sustained at 12.3 mph (Thank you Garmin!) was less severe. Let's hope so. Recovery is usually 6-8 weeks, so hoping to ride in 6 weeks. Will play it by ear and try very hard not to re-injure myself between now and then. It was 2 weeks now this Wed, and my mobility is pretty good, but I'm not taking any chances. It was pretty reassuring that Deb knew exactly where I was, because I've been using LiveTrack on my new Garmin religiously, so she can track me via satellite in real-time. As it was I called her on the phone and told her I had crashed and was on my way home, but it did really freak her out. I guess the problem with her stitches didn't help matters. I had all kinds of problems with my new Edge 520 Plus not syncing with my phone, laptop, Strava, RWGPS, etc. but after a half-dozen mystery updates of Android and Garmin Connect everything started working correctly. I decided to brighten up the helmet for winter riding, because I often ride until sunset, and potentially after sunset if I have a mechanical, so I went with a color Bell calls "Retina Sear", in favor of the usual red & white scheme I tend to buy. It's a MIPS helmet as well, so I was happy to get it for only $55 from Amazon, though I've been doing a lot of business with BikeTiresDirect.com the last year as I like their membership benefits a lot. I went with a blue flashlight because Van Gogh told me to, and because my headsweat is blue & white, so they should look good together. On the back of the helmet, below the CygoLite Dice TL-50 (less than 1oz) is a long sticker shaped like an arrow that points to seemingly nothing on the back of the helmet, labeled "reflector", and indeed, the helmet has a reflective stripe across the back. I wish it were red instead of white, but still a nice feature. Another nice feature of this Bell Falcon helmet is the center vent is uninterrupted by any cross-member except for a slotted one made of the ABS plastic the skeleton of the helmet is comprised of. That leaves almost a full inch of airspace between your head and the top of the helmet all the way down the middle of the helmet. Talk about a vent! I still have to retape the bars, and fix the R-shifter, but hopefully sometime between Thanksgiving and Christmas, I will be out there riding again! So much has changed since my last post it's hard to know where to start, but the big items would be me moving from Sacramento, home of the greatest bike trail EVER (American River Parkway Trail) to the retirement community of Apple Valley, Ca and taking up riding again after a shocking diagnosis of Non-Alcoholic Fatty Liver Disease (NAFLD). In short, my liver metabolizes fructose like some people's does alcohol, so aside from eliminating sugar and a lot of starches from my diet, I took up riding again, AND, lost 25lbs. It worked, and my liver is now looking great, not progressing to cirrhosis. With the US experiencing an obesity epidemic, this is destined to become a huge problem in the coming years. As for me, I'm not sure why I developed a problem aside from getting up to 205 lbs (too much retirement I guess). Three years ago on Sep 13th I drove myself to the ER, as my HR meds had utterly and catastrophically stopped working. My BP was 213/111 after being held 4+ hours before any effective meds were forthcoming. After returning home 3 days latter I began to notice I couldn't find words in conversation, nor when writing, and realized I had a stroke. It took about a year to fully recover from that, so retirement has been a bit challenging medically. On the plus side, I found a wonderful woman who is a great companion I love spending my days and nights with, and who brings meaning and joy every single day. She did worry about me being so far out on rides though, so offered to pay half the cost of a new Garmin 520+ with LiveTracker, so she knows where I am at all times. It's really a great feature, although getting everything paired, repaired, synched, and updating automatically was a very serious PITA. I almost returned the Garmin before 6-8 Garmin Connect and Android updates made all those issues magically disappear. To resuming riding, almost exactly a year ago today, I had to learn to breath up here and 3,000ft, and do some long-overdue bike maintenance and; upgrades. To that end I bought a bunch of new tires and tubes, Michelin Pro4 Endurance II or Power Competition for the most part, and a bunch of Conti Race 28 tubes. The high desert is full of nasty thorns and goat-heads. I replaced the last stock part on the bike, an old FSA crank, with an Ultegra 6700 Triple and DuraAce bottom bracket; the 3rd one now for my '06 Roubaix Elite. I like the smaller ends and fiber over-grip they go on with. No marring of the bearing ends is possible as the fiber is softer than the aluminum ends. The only thing left stock on my Roubaix is now the frame. I also replaced the SRAM Force Ti brakes with new Ultegra 6800. You may recall a few years ago I discovered some serious pitting on the bridge of the back brake, so this too was overdue. Nothing special about Ultegra brakes, but they match all the other Ultegra 6700 gear on the bike and they were a steal just before Christmas last year. I also have a good riding partner, though I often ride alone so I can ride at my pace, time of day, etc. I find myself teaching him the same things my original riding partner Bruce taught me 10 yrs ago, and the many, many things riding has taught me through experience. There's also a bike group here, but they are a bit odd in that they don't have monthly meetings, have no political agenda to move infrastructure forward here, or sponsor events. So far I haven't ridden with them, but I may soon. In what I thought would be a very red-necked place, and perhaps is in some ways, I have to say the motorists have been great partners in safety for the most part. There are also good places to ride and if you can pick your hours, the weather is pretty accommodating all year around. The roads can be pretty rough here, and asphalt "divots" flipped up on top of the road are common, and VERY dangerous. If you hit one you're almost certainly going down. 100 nights a year with frost play hell with roads that leak water down through their surface. Afternoon winter rides in the 60s are common, and in the 70s in July & Aug at 6:30AM. The transition is a bit sketchy at times. My last ride though was 2hrs starting at 3:00PM; kind of a gut check, but wanted to make sure I could ride in the mid-day heat before swearing off mornings. Check! Aside from the new Garmin I have kept improving my lights, and use daylight flashers now all the time as I don't ride at night on purpose (always need to be prepared to continue after dark when riding in the afternoon as mechanicals and flats are always possible) and want to be as visible as possible up to the point where my lights might become annoying. The CygoLite Metro 1100 up front, and Lezyne Laser Drive in back work quite well in conjunction with a small Dice TL-50 Velcro-ed to the back of my helmet (well under 1 oz without the rubber strap mount). The bike felt a little big to me after 2-3 years off, and I eventually realized that I've shrunk! My always long torso is now about normal, so my 54cm frame now fits me perfectly; I just needed to ditch my 120mm stem for a 100mm and move my seat back. After riding for years in the TT position I am now riding in a classic position, which has been great for both power and endurance, not relying so much on my quads and using all of my leg muscles together. In late July I added a Topeak ride-fuel bag on the top-tube, which enables me to use a tiny saddle bag, in conjunction to the CO2 bottle holders on my Profile Designs AquaRack. All of this because that Lezyne taillight is pretty big and with a 25oz bottle on each side, I needed the very small bag so the light could get out, and to keep the total weight on the seat-post down. Finally, 2 weeks ago I bought an arm-band type HR monitor, as 3 chest straps failed to work. It turns out 20+ yrs in the gym leave my pecs pushing any HR strap away from my heart, BUT, the Scosche HR band is much cooler and doesn't restrict my breathing either. It even synched perfectly with my old Garmin Edge 305, AND, at the same time pushed data to my phone via BlueTooth. Mostly though, it's just so comfortable I forget it's there all the time. I know it's been a long time, but I hope some of you will give me a shout-out and let me know what you're doing these days yourselves.